186:0.1 AS JESUS and his accusers started off to see Herod, the Master turned to the Apostle John and said: “John, you can do no more for me. Go to my mother and bring her to see me ere I die.” When John heard his Master’s request, although reluctant to leave him alone among his enemies, he hastened off to Bethany, where the entire family of Jesus was assembled in waiting at the home of Martha and Mary, the sisters of Lazarus whom Jesus raised from the dead. 186:0.2 Several times during the morning, messengers had brought news to Martha and Mary concerning the progress of Jesus’ trial. But the family of Jesus did not reach Bethany until just a few minutes before John arrived bearing the request of Jesus to see his mother before he was put to death. After John Zebedee had told them all that had happened since the midnight arrest of Jesus, Mary his mother went at once in the company of John to see her eldest son. By the time Mary and John reached the city, Jesus, accompanied by the Roman soldiers who were to crucify him, had already arrived at Golgotha. 186:0.3 When Mary the mother of Jesus started out with John to go to her son, his sister Ruth refused to remain behind with the rest of the family. Since she was determined to accompany her mother, her brother Jude went with her. The rest of the Master’s family remained in Bethany under the direction of James, and almost every hour the messengers of David Zebedee brought them reports concerning the progress of that terrible business of putting to death their eldest brother, Jesus of Nazareth. 186:1.1 It was about half past eight o’clock this Friday morning when the hearing of Jesus before Pilate was ended and the Master was placed in the custody of the Roman soldiers who were to crucify him. As soon as the Romans took possession of Jesus, the captain of the Jewish guards marched with his men back to their temple headquarters. The chief priest and his Sanhedrist associates followed close behind the guards, going directly to their usual meeting place in the hall of hewn stone in the temple. Here they found many other members of the Sanhedrin waiting to learn what had been done with Jesus. 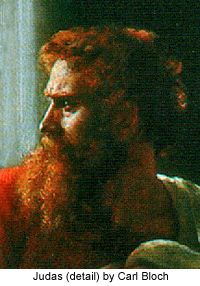 As Caiaphas was engaged in making his report to the Sanhedrin regarding the trial and condemnation of Jesus, Judas appeared before them to claim his reward for the part he had played in his Master’s arrest and sentence of death. 186:1.2 All of these Jews loathed Judas; they looked upon the betrayer with only feelings of utter contempt. 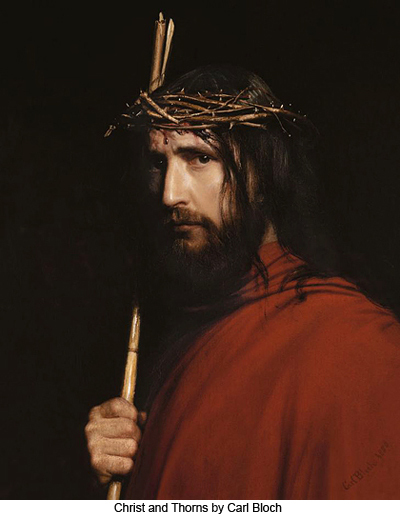 Throughout the trial of Jesus before Caiaphas and during his appearance before Pilate, Judas was pricked in his conscience about his traitorous conduct. And he was also beginning to become somewhat disillusioned regarding the reward he was to receive as payment for his services as Jesus’ betrayer. He did not like the coolness and aloofness of the Jewish authorities; nevertheless, he expected to be liberally rewarded for his cowardly conduct. He anticipated being called before the full meeting of the Sanhedrin and there hearing himself eulogized while they conferred upon him suitable honors in token of the great service which he flattered himself he had rendered his nation. Imagine, therefore, the great surprise of this egotistic traitor when a servant of the high priest, tapping him on the shoulder, called him just outside the hall and said: “Judas, I have been appointed to pay you for the betrayal of Jesus. Here is your reward.” And thus speaking, the servant of Caiaphas handed Judas a bag containing thirty pieces of silver—the current price of a good, healthy slave. 186:1.3 Judas was stunned, dumfounded. He rushed back to enter the hall but was debarred by the doorkeeper. He wanted to appeal to the Sanhedrin, but they would not admit him. 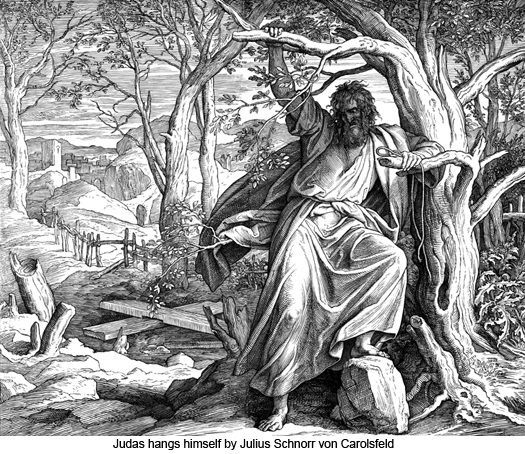 Judas could not believe that these rulers of the Jews would allow him to betray his friends and his Master and then offer him as a reward thirty pieces of silver. He was humiliated, disillusioned, and utterly crushed. He walked away from the temple, as it were, in a trance. He automatically dropped the money bag in his deep pocket, that same pocket wherein he had so long carried the bag containing the apostolic funds. And he wandered out through the city after the crowds who were on their way to witness the crucifixions. 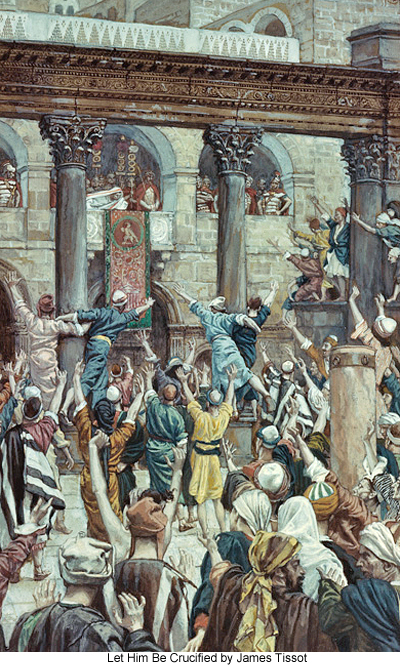 186:1.6 As Judas left the Sanhedrin chamber, he removed the thirty pieces of silver from the bag and threw them broadcast over the temple floor. When the betrayer left the temple, he was almost beside himself. Judas was now passing through the experience of the realization of the true nature of sin. All the glamor, fascination, and intoxication of wrongdoing had vanished. Now the evildoer stood alone and face to face with the judgment verdict of his disillusioned and disappointed soul. Sin was bewitching and adventurous in the committing, but now must the harvest of the naked and unromantic facts be faced. 186:1.7 This onetime ambassador of the kingdom of heaven on earth now walked through the streets of Jerusalem, forsaken and alone. His despair was desperate and well-nigh absolute. On he journeyed through the city and outside the walls, on down into the terrible solitude of the valley of Hinnom, where he climbed up the steep rocks and, taking the girdle of his cloak, fastened one end to a small tree, tied the other about his neck, and cast himself over the precipice. Ere he was dead, the knot which his nervous hands had tied gave way, and the betrayer’s body was dashed to pieces as it fell on the jagged rocks below. 186:2.1 When Jesus was arrested, he knew that his work on earth, in the likeness of mortal flesh, was finished. He fully understood the sort of death he would die, and he was little concerned with the details of his so-called trials. 186:2.2 Before the Sanhedrist court Jesus declined to make replies to the testimony of perjured witnesses. There was but one question which would always elicit an answer, whether asked by friend or foe, and that was the one concerning the nature and divinity of his mission on earth. When asked if he were the Son of God, he unfailingly made reply. He steadfastly refused to speak when in the presence of the curious and wicked Herod. Before Pilate he spoke only when he thought that Pilate or some other sincere person might be helped to a better knowledge of the truth by what he said. Jesus had taught his apostles the uselessness of casting their pearls before swine, and he now dared to practice what he had taught. His conduct at this time exemplified the patient submission of the human nature coupled with the majestic silence and solemn dignity of the divine nature. He was altogether willing to discuss with Pilate any question related to the political charges brought against him—any question which he recognized as belonging to the governor’s jurisdiction. 186:2.3 Jesus was convinced that it was the will of the Father that he submit himself to the natural and ordinary course of human events just as every other mortal creature must, and therefore he refused to employ even his purely human powers of persuasive eloquence to influence the outcome of the machinations of his socially nearsighted and spiritually blinded fellow mortals. Although Jesus lived and died on Urantia, his whole human career, from first to last, was a spectacle designed to influence and instruct the entire universe of his creation and unceasing upholding. 186:2.4 These shortsighted Jews clamored unseemlily for the Master’s death while he stood there in awful silence looking upon the death scene of a nation—his earthly father’s own people. 186:2.5 Jesus had acquired that type of human character which could preserve its composure and assert its dignity in the face of continued and gratuitous insult. He could not be intimidated. When first assaulted by the servant of Annas, he had only suggested the propriety of calling witnesses who might duly testify against him. 186:2.7 When before Caiaphas, and when all the perjured testimony had broken down, Jesus did not hesitate to answer the question of the chief priest, thereby providing in his own testimony that which they desired as a basis for convicting him of blasphemy. 186:2.8 The Master never displayed the least interest in Pilate’s well-meant but halfhearted efforts to effect his release. He really pitied Pilate and sincerely endeavored to enlighten his darkened mind. He was wholly passive to all the Roman governor’s appeals to the Jews to withdraw their criminal charges against him. Throughout the whole sorrowful ordeal he bore himself with simple dignity and unostentatious majesty. He would not so much as cast reflections of insincerity upon his would-be murderers when they asked if he were "king of the Jews.” With but little qualifying explanation he accepted the designation, knowing that, while they had chosen to reject him, he would be the last to afford them real national leadership, even in a spiritual sense. 186:2.9 Jesus said little during these trials, but he said enough to show all mortals the kind of human character man can perfect in partnership with God and to reveal to all the universe the manner in which God can become manifest in the life of the creature when such a creature truly chooses to do the will of the Father, thus becoming an active son of the living God. 186:2.11 Pilate spoke more truly than he knew when, after Jesus had been scourged, he presented him before the multitude, exclaiming, “Behold the man!” Indeed, the fear-ridden Roman governor little dreamed that at just that moment the universe stood at attention, gazing upon this unique scene of its beloved Sovereign thus subjected in humiliation to the taunts and blows of his darkened and degraded mortal subjects. And as Pilate spoke, there echoed throughout all Nebadon, “Behold God and man!” Throughout a universe, untold millions have ever since that day continued to behold that man, while the God of Havona, the supreme ruler of the universe of universes, accepts the man of Nazareth as the satisfaction of the ideal of the mortal creatures of this local universe of time and space. In his matchless life he never failed to reveal God to man. Now, in these final episodes of his mortal career and in his subsequent death, he made a new and touching revelation of man to God. 186:3.1 Shortly after Jesus was turned over to the Roman soldiers at the conclusion of the hearing before Pilate, a detachment of the temple guards hastened out to Gethsemane to disperse or arrest the followers of the Master. But long before their arrival these followers had scattered. The apostles had retired to designated hiding places; the Greeks had separated and gone to various homes in Jerusalem; the other disciples had likewise disappeared. David Zebedee believed that Jesus’ enemies would return; so he early removed some five or six tents up the ravine near where the Master so often retired to pray and worship. Here he proposed to hide and at the same time maintain a center, or co-ordinating station, for his messenger service. David had hardly left the camp when the temple guards arrived. Finding no one there, they contented themselves with burning the camp and then hastened back to the temple. On hearing their report, the Sanhedrin was satisfied that the followers of Jesus were so thoroughly frightened and subdued that there would be no danger of an uprising or any attempt to rescue Jesus from the hands of his executioners. They were at last able to breathe easily, and so they adjourned, every man going his way to prepare for the Passover. 186:3.3 Throughout this tragic day, until the message finally went forth that the Master had been laid in the tomb, David sent messengers about every half hour with reports to the apostles, the Greeks, and Jesus’ earthly family, assembled at the home of Lazarus in Bethany. When the messengers departed with the word that Jesus had been buried, David dismissed his corps of local runners for the Passover celebration and for the coming Sabbath of rest, instructing them to report to him quietly on Sunday morning at the home of Nicodemus, where he proposed to go in hiding for a few days with Andrew and Simon Peter. 186:3.4 This peculiar-minded David Zebedee was the only one of the leading disciples of Jesus who was inclined to take a literal and plain matter-of-fact view of the Master’s assertion that he would die and “rise again on the third day.” David had once heard him make this prediction and, being of a literal turn of mind, now proposed to assemble his messengers early Sunday morning at the home of Nicodemus so that they would be on hand to spread the news in case Jesus rose from the dead. David soon discovered that none of Jesus’ followers were looking for him to return so soon from the grave; therefore did he say little about his belief and nothing about the mobilization of all his messenger force on early Sunday morning except to the runners who had been dispatched on Friday forenoon to distant cities and believer centers. 186:3.5 And so these followers of Jesus, scattered throughout Jerusalem and its environs, that night partook of the Passover and the following day remained in seclusion. 186:4.1 After Pilate had washed his hands before the multitude, thus seeking to escape the guilt of delivering up an innocent man to be crucified just because he feared to resist the clamor of the rulers of the Jews, he ordered the Master turned over to the Roman soldiers and gave the word to their captain that he was to be crucified immediately. 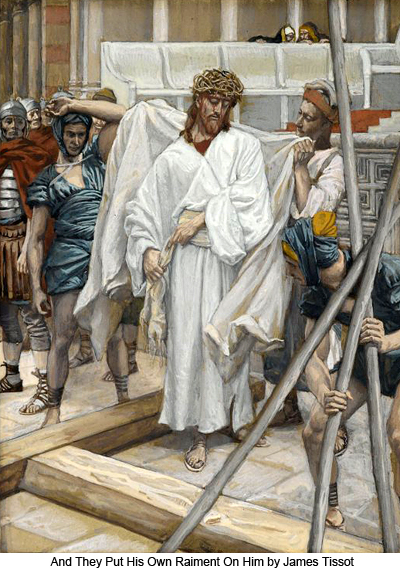 Upon taking charge of Jesus, the soldiers led him back into the courtyard of the praetorium, and after removing the robe which Herod had put on him, they dressed him in his own garments. These soldiers mocked and derided him, but they did not inflict further physical punishment. Jesus was now alone with these Roman soldiers. His friends were in hiding; his enemies had gone their way; even John Zebedee was no longer by his side. 186:4.2 It was a little after eight o’clock when Pilate turned Jesus over to the soldiers and a little before nine o'clock when they started for the scene of the crucifixion. During this period of more than half an hour Jesus never spoke a word. The executive business of a great universe was practically at a standstill. Gabriel and the chief rulers of Nebadon were either assembled here on Urantia, or else they were closely attending upon the space reports of the archangels in an effort to keep advised as to what was happening to the Son of Man on Urantia. 186:4.3 By the time the soldiers were ready to depart with Jesus for Golgotha, they had begun to be impressed by his unusual composure and extraordinary dignity, by his uncomplaining silence. 186:4.4 Much of the delay in starting off with Jesus for the site of the crucifixion was due to the last-minute decision of the captain to take along two thieves who had been condemned to die; since Jesus was to be crucified that morning, the Roman captain thought these two might just as well die with him as wait for the end of the Passover festivities. 186:4.5 As soon as the thieves could be made ready, they were led into the courtyard, where they gazed upon Jesus, one of them for the first time, but the other had often heard him speak, both in the temple and many months before at the Pella camp. 186:5.1 There is no direct relation between the death of Jesus and the Jewish Passover. True, the Master did lay down his life in the flesh on this day, the day of the preparation for the Jewish Passover, and at about the time of the sacrificing of the Passover lambs in the temple. But this coincidental occurrence does not in any manner indicate that the death of the Son of Man on earth has any connection with the Jewish sacrificial system. 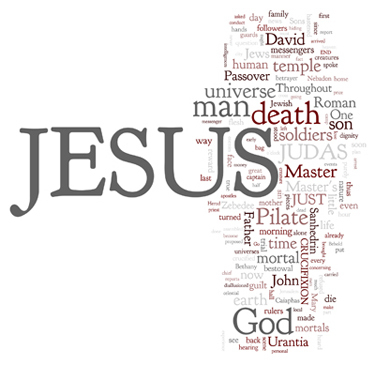 Jesus was a Jew, but as the Son of Man he was a mortal of the realms. The events already narrated and leading up to this hour of the Master’s impending crucifixion are sufficient to indicate that his death at about this time was a purely natural and man-managed affair. 186:5.2 It was man and not God who planned and executed the death of Jesus on the cross. True, the Father refused to interfere with the march of human events on Urantia, but the Father in Paradise did not decree, demand, or require the death of his Son as it was carried out on earth. It is a fact that in some manner, sooner or later, Jesus would have had to divest himself of his mortal body, his incarnation in the flesh, but he could have executed such a task in countless ways without dying on a cross between two thieves. All of this was man’s doing, not God's. 186:5.3 At the time of the Master’s baptism he had already completed the technique of the required experience on earth and in the flesh which was necessary for the completion of his seventh and last universe bestowal. At this very time Jesus’ duty on earth was done. All the life he lived thereafter, and even the manner of his death, was a purely personal ministry on his part for the welfare and uplifting of his mortal creatures on this world and on other worlds. 186:5.4 The gospel of the good news that mortal man may, by faith, become spirit-conscious that he is a son of God, is not dependent on the death of Jesus. True, indeed, all this gospel of the kingdom has been tremendously illuminated by the Master’s death, but even more so by his life. 186:5.6 The Father in heaven loved mortal man on earth just as much before the life and death of Jesus on Urantia as he did after this transcendent exhibition of the copartnership of man and God. This mighty transaction of the incarnation of the God of Nebadon as a man on Urantia could not augment the attributes of the eternal, infinite, and universal Father but it did enrich and enlighten all other administrators and creatures of the universe of Nebadon. While the Father in heaven loves us no more because of this bestowal of Michael, all other celestial intelligences do. And this is because Jesus not only made a revelation of God to man, but he also likewise made a new revelation of man to the Gods and to the celestial intelligences of the universe of universes.